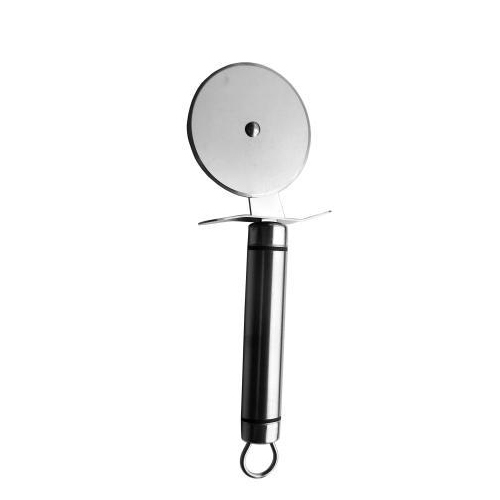 Small Pizza Cutter | Kitchen Tool(KEB-212) - Keywood International Inc. This small pizza cutter is ideal for cutting pasta and pizza. The straight blade makes it ideal to roll the wheel and cut clean lines along the dough. Made of high carbon stainless steel for effortless cutting experience. Handle end contains slot for hanging when drying or not in use. 1 piece small pizza pasta cutter. Ideal for slicing and cutting through pizza, pasta and other varieties. Made of high quality food-grade stainless steel. Excellent rust resistance, corrosion resistance, and heat resistance. Slot on the handle can be used for hanging when not in use. Mirrored polished for superior, high-lustre shine. Available in different packaging: white box, color window box, gift box, etc.